Good day vaping friends. After a bit of a hiatus, I’ve got some juices that I’d like to share over the next couple weeks, and maybe you’ll find yourself a new favorite. First up from our friends at The Vapor Hut, is an RY4 spinoff titled RYD2. Once again, their Star Wars references had already convinced me to purchase, even before I was informed that I was missing out by not vaping this excellent e-juice. 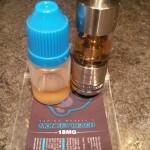 It is described on The Vapor Hut’s site as an extra nutty spin on RY4 with hazelnut. When I first began vaping, which was a little over 3 years ago, one of the first flavors I tried was RY4, and that was enough to keep me around for the long haul. RYD2 has pretty much taken the place of some of my go-to RY4 juices, and that is based on flavor alone. The initial inhale of RYD2 has the familiar caramel tobacco, with vanilla undertones throughout. There is a fairly moderate throat hit that I’m getting that isn’t too heavy, but just right. Exhale brings in the hazelnut aspect that morphs very well with the tobacco, and is a nice takeover to the caramel/vanilla beginning flavor. RYD2 has been run through a myriad of delivery mediums, and everything from bottom coil tanks, including Dbox Puritank, AnyVape BCC Mega, Kanger everything, and iClear30 have all performed very well, and given fairly similar results. 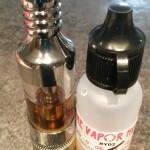 Drippers include my usual Igo-W and Nimbus, and gave excellent results as well. I’ll note here that RYD2 has given the best taste and performance between 4.2 – 4.8 volts, assuming you’re around ryd2 bottle1.8 – 2.1 ohms resistance on your coils/wicks. Flavor-wise, different delivery mediums have given slightly different variations. For example: on my current Puritank, I’m getting more of a salted pretzel finish and aftertaste, whereas with the BCC Mega the flavoring leans more toward graham crackers. Either way, both glass and polycarb have been equally tasty, but felt it was worth mentioning here. Vapor production of RYD2 is outstanding. This is by far the most vapor I’ve ever gotten out of the Puritank and BCC Mega. You can blow some pretty nice plumes with any delivery medium that you wish to use. Not to mention that my office also smells like a bakery, which isn’t a bad thing at all. I’ve basically torn through my bottle of RYD2 after a week of steeping, and it keeps getting better. The only bad part is that I’m going to have to reorder soon. Roughly ten days of steeping was about the time that everything really came together nicely. Coloration of juice has darkened a bit, to a medium orange, along with thickening up slightly as well. If you vape, try this juice out. RYD2 is excellent, and I plan to keep this one around. I had recently placed an order with Vaper Venue, and they included a sample of Monkey Beach with my order. Although this will be a short review (for yet another fruit vape), I felt that this juice was definitely worth mentioning. Monkey Beach is a banana and peach smoothie inspired juice. Although it was a sample, I still let a bit of steeping take place as I usually do, regardless of the juice, and it’s made a slight difference overall. In one week, the juice has thickened up a bit, but retained the same light orange, peachy coloration. Flavors became a bit more pronounced as well, and have more of a full-bodied taste. Delievery mediums I’ve tested out include an RSST, iClear30B, and Aerotank (pictured). Good results have come from all three, but a bit to my surprise, the Aerotank has been showing the best results as far as flavor and vapor production go, which in my experience has been fairly uncommon for higher VG based juices, but this is one of the exceptions. Monkey Beach was a great sample to receive, and is an all-around good fruit vape. During our recent snowpocalypse here in Atlanta, I had some time to try out some new juice arrivals (and order more as well), and definitely have some new and unique winners. 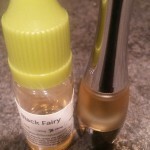 Starting off, Black Fairy from Good Life Vapor. Described as a mix of absinthe, blackberry, and a bit of magic, this was definitely a new vaping experience for me. The initial inhale of Black Fairy carries a nice, subtle blackberry and is very light on the throat hit. The blackberry quickly turns into a full on absinthe flavor that is pretty close to it’s real life counterpart. I wouldn’t go as far as saying that it rivals the exact flavoring of true absinthe, but does a very good job of coming close. The exhale carries a massive amount of flavor, and the anise inspired aspect is most prominent, while still retaining a bit of the blackberry undertone throughout. For the “magic” ingredient that Good Life Vapor lists, I’m beginning to think it may be a bit of Cool Hit, since after the exhale, you’re left with a cool, lingering licorice and anise aftertaste that sticks around for some time. Currently, I’m using a Smoktech Tumbler bottom coil and getting consistently good results on the SVD at 4 volts on 1.8 ohm coils. Vapor production has been pretty decent overall as well, giving medium sized clouds on Black Fairy Bottlemy usual run of bottom coil tanks. I haven’t had a tank or dripper that didn’t play well with Black Fairy yet, so plenty of good delivery medium options. My guess for PG/VG ratio is probably about 60/40 based on juice thickness and vapor production. Steeping Black Fairy for about one to two weeks is a must, especially in my experience. Out of the package, Black Fairy was a very lightly colored juice, with a prominent licorice flavor that was almost overpowering. After ten days of steeping, this juice really came through and tastes superb. Juice has thickened up a bit and is now medium orange in coloration. The flavors have blended very well and mellowed out after steeping, so once again, give it some time to mature after your vape mail arrives.